The ultra-soft organic bamboo and cotton fiber Miniboo Hooded Baby Towel is the perfect hooded pillow for a post-bath routine for children up to age 5. The 70/30 mix of bamboo and cotton fibers are super-soft for your child’s sensitive skin, and the thick, quality 500 gsm weight means it’s up to 50% thicker than regular baby towels, therefore consequently more absorbent, warm, and snuggly. 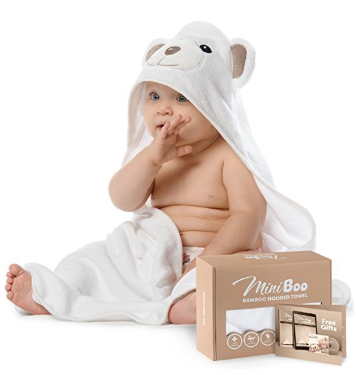 The Miniboo Hooded Baby Towel is not only comfortable and useful, but will make your baby or toddler look adorable as well, with a cute bear design printed on the hood, and little fabric ears, completing the look! It’s gender neutral and predominantly white colored, so it’s perfect for any baby or toddler. In addition to being a bath towel, it can be used as a cover-up for the pool, lake, or beach, or a hooded towel for those same locations, and even a light bathrobe at home. Fits children ages 0 to 5. Slightly more expensive than plain cotton baby towels. Not ideal for children who don’t like hoods or similar on their head. In conclusion, the Miniboo Hooded Baby Towel is an affordable, soft, absorbent hooded towel perfect for newborns through children as old as 5. It swaddles and protects your baby while drying and keeping them warm.